Introduction: Chronic antibody-mediated rejection (CAMR) has now emerged as one of the most common causes of chronic graft failure. In this study, we tried to study the clinical details, morphological features, risk factors, and outcome of biopsy-proven CAMR. Materials and Methods: This was a retrospective study including 14 patients' with biopsy-proven CAMR. The clinical details, posttransplantation duration, risk factors, histomorphological features, immunohistochemical features, treatment protocol, and graft outcome of all the patients were studied. Results: There were 11 male and 3 female patients and the mean age at biopsy was 33 ± 10 years. The mean transplant duration to the diagnosis of CAMR was 61 months. The mean serum creatinine levels and 24-h proteinuria at the time of biopsy were 5.3 ± 4.5 mg/dl and 3.4 ± 0.9 g/24 h, respectively. Four patients had a previous episode of rejection and three patients had a concurrent hepatitis C virus (HCV) infection. Transplant glomerulopathy (TG) was seen in all 14 biopsies and all were positive for C4D in the peritubular capillaries. Twelve of these progressed to graft failure. Conclusion: CAMR is an important cause of chronic graft rejection, with a majority of cases progressing to graft failure. TG is the most commonly observed histomorphological pattern and the severity of TG seems to be associated with poor graft survival. An associated HCV infection further hinders the graft survival. Renal transplantation is the treatment of choice for end-stage renal disease (ESRD) and has shown to improve the quality of life and survival of patients with ESRD., Renal transplantation program has shown a tremendous improvement in India over the past 50 years and is currently second only to the USA in numbers. However, these grafts are subjected to a variety of immune and nonimmune injuries which can ultimately lead to loss of graft. The revised 2017 Banff criteria for CAMR includes: (1) the presence of morphologic evidence of chronic tissue injury manifesting in the form of transplant glomerulopathy (TG), peritubular capillary (PTC) basement membrane multilayering or arterial intimal fibrosis of new-onset excluding other causes, (2) evidence of current or recent antibody interaction with vascular endothelium in the form of linear C4D staining of PTCs or at least moderate microvascular inflammation (MVI) or increased expression of gene transcripts/classifiers strongly associated with antibody-mediated rejection (ABMR), and (3) serologic evidence of DSAs. In contrast to the 2015 Banff criteria, the revised 2017 criteria do not mandate the detection of DSAs, instead it can be substituted by C4D staining or increased expression of validated transcripts/classifiers in the biopsy tissue. However, DSA testing is strongly recommended in all biopsy specimens diagnosed as CAMR. In this study, we have tried to study the clinical details, morphological features, risk factors, and outcome of biopsy-proven CAMR. This was a retrospective study including all biopsy-proven cases of CAMR over a period of 2½ years from January 2016 to June 2018. The demographic and clinical data including age, gender, clinical presentation, the type and duration of transplant, serum creatinine at the time of biopsy and follow-up, and immunosuppressive regimens of all the cases were retrieved from the patient files. The biopsies were evaluated by light microscopy with the help of hematoxylin and eosin, periodic acid–Schiff, Masson trichrome, and Jones Methenamine Silver. C4D immunohistochemistry using C4D antibody (cat no.AR 572-5R, Biogenex) was also performed and was recorded as positive when there was PTC staining. All the glomerular, tubular, interstitial, and vascular features were carefully examined, and the scoring was done according to the Banff criteria 2017. Immunofluorescence was performed in all cases with the help of fluorescein isothiocyanate tagged antibodies to immunoglobulin IgM, IgA, IgG, C3, C19, and kappa and lambda chains. In our institute, all the allograft biopsies are indicated, biopsies performed during an episode of graft dysfunction, and protocol biopsies are not routinely performed. The patients received triple immunosuppression comprising of steroids, cyclosporine/mycophenolate mofetil, and azathioprine/tacrolimus. Two patients received an additional induction with basiliximab. Graft loss was defined as complete graft dysfunction, significantly elevated serum creatinine levels or dialysis dependence. Patients with uremic symptoms or a baseline serum creatinine >1.5 mg/dl were categorized as cases of persistent graft dysfunction, and normal graft function was defined as the absence of uremic symptoms and serum creatinine <1.5 mg/dl. Over the study period, a total of 126 allograft biopsies were performed, of which 23 were diagnosed as active ABMR and 14 were diagnosed as chronic active ABMR as per updated 2017 Banff criteria. Of the 14 biopsies included in this study, there were 11 male and 3 female patients. The mean age at biopsy was 33 ± 10 years and one of these patients was below 20 years of age. Eleven patients received the graft from living-related donors, two from live unrelated, and one from a deceased donor. The mean transplant duration to the diagnosis of CAMR was 61 months. The mean serum creatinine level at the time of biopsy was 5.3 ± 4.5 mg/dl. 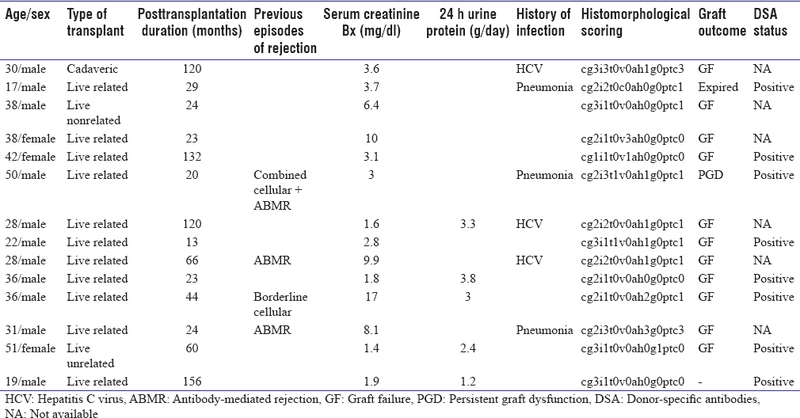 Five patients presented with proteinuria with a mean 24 h urine protein of 3.4 ± 0.9 g/24 h. Four patients had a previous episode of rejection of which two had a prior episode of active ABMR, one a prior episode of borderline rejection, and one had an episode of combined cellular and ABMR. Eight patients showed positivity for DSAs. Of these, five patients progressed to graft failure, one was in persistent graft dysfunction, and one patient expired. The entire demographic and clinical data of patients are depicted in [Table 1]. TG was seen in all 14 biopsies. Of these, five showed severe TG, seven were moderate, and two showed mild TG. Nine biopsies showed peritubular capillaritis, and tubulitis was seen in only two biopsies. Vascular hyalinization was seen in two biopsies, and arteriolar hyalinosis was seen in six biopsies. Interstitial inflammation was observed in all the 14 biopsies. The features of tubulointerstitial chronicity in the form of interstitial fibrosis and tubular atrophy (IFTA) were seen in 12 biopsies with five showing an IFTA >50%. The mean IFTA score was 41%. Only one biopsy in our cohort showed evidence of glomerulitis (g). The mean g+ptc score was 1.1. All 14 biopsies showed peritubular capillary positivity for C4d [Figure 1]. Most of the patients underwent plasmapheresis in combination with intravenous Ig (IVIg) and rituximab, while bortezomib was given to two patients. On follow-up, 12 patients went into graft loss, one patient was in persistent graft dysfunction, and one patient had expired. The last few decades have seen tremendous progress in the short-term outcome of the renal transplants; however, despite the development of new immunosuppressive regimens long-term outcomes have shown only a marginal improvement.,,, CAMR first described as a specific entity in 2001 has now emerged as the primary cause of chronic graft failure and the different treatment modalities are not very satisfactory.,,,,, Several authors have thus tried to elucidate the morphological features and analyze the risk factors involved in the development of CAMR. In this study, we describe a series of 14 patients diagnosed as CAMR as per the Banff criteria 2017. In our study, the mean age of the patients at the time of biopsy was 33 ± 10 years. This observation was slightly lower compared to studies conducted by Torres et al. and Redfield et al., wherein, the mean age of the patients was 35 ± 14 and 42.9 ± 13 years, respectively. Redfield et al. studied the clinicopathological features of 123 patients with biopsy-proven CAMR and inferred that serum creatinine levels >3 mg/dl at the time of biopsy was associated with rapid graft loss. Likewise, Kieran et al., who studied the impact of C4D and TG on graft outcome showed that serum creatinine levels >2.3 mg/dl were associated with poor graft function. Similar to these findings, the mean serum creatinine level at the time biopsy was 5.7 mg/dl with adverse graft outcome in majority of the patients. Aggressive therapy can successfully reverse an episode of acute rejection, nevertheless, acute rejection may have an adverse impact on long-term survival of the grafts. Meier-Kriesche et al. studied the impact of acute rejection on chronic graft failure in a large case series and showed a close association between a previous episode of active ABMR and loss of graft; however, Redfield et al. showed that 66.7% of the patients in their study had a prior episode of acute rejection, however there was no impact on the outcome. In our study, only four patients had a documented earlier episode of rejection. Three of these progressed to graft failure, while one had persistent graft dysfunction. However, it is difficult to establish a significant association between CAMR and a previous episode of rejection. Protocol biopsies may help in documenting a subclinical evidence of acute rejection. MPGN can be differentiated with the help of immunofluorescence which demonstrates immune complexes or by electron microscopy, which shows subendothelial immune deposits. All the biopsies showed negative immunofluorescence in our study. Chronic TMA, a known complication of calcineurin inhibitor toxicity can also have morphologic overlap with TG., However, CAMR biopsies showed a C4D positivity. Furthermore, there was no evidence of prior acute TMA in any of our patients. Hepatitis C infection is an important cause of glomerular disease in both native as well as transplanted kidneys. In the presence of hepatitis C virus (HCV) infection, MPGN is the most commonly encountered glomerular disease in renal transplants; however, the presence of HCV antibodies also seems to be an independent risk factor leading to TG., TG in HCV is perhaps due to glomerular deposition of immune complexes containing HCV or attenuated antibody-mediated injury., Baid-Agrawal et al. found that one-third cases of HCV with TG demonstrated C4D positivity in the PTCs thus making it difficult to distinguish between CAMR and HCV-associated TG. One way of differentiating HCV is to use specific monoclonal antibodies to detect antigens in the glomeruli, however, the reproducibility of this method is not very good. Thus, despite the lack of knowledge about the exact pathogenesis behind HCV-associated TG, it is important to screen for HCV antibodies as the presence of HCV infection almost always leads to graft failure.,,, Three of our patients had concurrent HCV infection, out of which one showed severe TG with a cg score of 3 and two showed a cg score of 2. All the three patients lost their graft. Regardless of the etiology, TG lesions are irreversible and worsen with time.,, Cosio et al. studied a series of surveillance biopsies done 1 year after transplantation and identified TG as a potential risk factor for the graft failure, and Baid-Agrawal et al. deciphered that the prognosis was even worse in the presence of hepatitis C infection. Gloor et al. and Fotheringham et al. postulated that a higher cg score was associated with poor graft survival. In our study, we did not see any significant association between graft survival and severity of TG. TG is known to be associated with C4D positivity in PTCs and DSA antibodies. The patients are known to develop de novo DSAs to HLA Class II and it is important to monitor the DSA levels at frequent intervals. However, due to financial issues and cost-effectiveness, this monitoring was not done in our patients. Late acute ABMR is yet another entity whose morphology overlaps with CAMR. It usually develops 3 months after transplantation and was mostly seen in noncompliant patients or when there was the withdrawal of immunosuppressive therapy., Histologically, it shows features of chronic injury including TG, interstitial fibrosis, PTC basement membrane multilayering, and intimal thickening in arterioles., All these features are similar to that of CAMR, thus making it difficult to distinguish between the two. However, both are associated with poor graft survival and at times are discussed together. It has been postulated that interstitial fibrosis and inflammation is a pattern of injury and can be seen in numerous conditions including cellular rejection, antibody rejection, and viral infection., Cosio et al. showed that despite using advanced immunosuppressive regimens there seems to be no improvement in controlling fibrosis, which can eventually lead to graft failure. Gago et al. stated that interstitial fibrosis alone is not a good predictor of reduced graft survival; however, in combination with inflammation shows a strong association with poor graft survival. In this study, the mean IFTA score was 41% and there were four patients with an IFTA >50%. MVI is defined as the accumulation of inflammatory cells in the PTCs and glomeruli.,, It is a sign of active progression in ABMR, irrespective of the presence or absence of TG.,, Einecke et al. and Racusen and Bagnasco postulated that capillaritis and glomerulitis are signs of impending chronic rejection and are associated with poor graft survival. de Kort et al. and Sis et al. identified the MVI scores as a strong predictor of graft loss. In our study peritubular capillaritis was seen in nine patients, and the mean g+ptc score was 1.1; however, only one biopsy showed the evidence of glomerulitis. Despite the availability of advanced immunosuppressive and desensitization regimens patients with chronic ABMR progressed to graft failure. Several studies have accepted the combination of plasmapheresis, IVIg, and rituximab as an excellent regimen for active ABMR; however, the results in CAMR have been unsatisfactory.,,,,,, Fehr et al. showed that a combination of IVIg which removed the antibodies and Rituximab which prevented further development of antibodies improves allograft function and reduced the DSA levels however the response was far inferior to acute antibody-mediated rejection; however, the response was far inferior to active ABMR. Moreso et al. studied the efficacy of IVIg in combination with rituximab and concluded that this combination was not useful in patients with TG and elevated DSA levels. Bortezomib, a protease inhibitor causing apoptosis of plasma cell, cells has shown promising results in early ABMR. Waiser et al. compared the efficacy of rituximab and bortezomib and concluded that renal function was better in patients treated with bortezomib. Although the pathophysiology of CAMR has been understood, there is a dire need for clinical trials to develop better therapies. The failure of the new therapies thus makes it mandatory to focus on identifying the risk factors and preventing CAMR and further studies are required. CAMR is a common cause of late allograft loss with inevitable progression to graft failure. Prior episodes of active rejection need not be documented. TG is the most commonly encountered histomorphological pattern which needs to be differentiated from chronic TMA and MPGN. C4D positivity helps in making a diagnosis of CAMR with or without DSA. El-Zoghby ZM, Stegall MD, Lager DJ, Kremers WK, Amer H, Gloor JM, et al. Identifying specific causes of kidney allograft loss. Am J Transplant 2009;9:527-35. Katsuma A, Yamakava T, Nakada Y, Yamamoto I, Takashi Y. Histopathological findings in transplanted kidneys. Renal Transplant Ther 2017;3:1-18. Shroff S. Current trends in kidney transplantation in India. Indian J Urol 2016;32:173-4. Garces JC, Giusti S, Staffeld-Coit C, Bohorquez H, Cohen AJ, Loss GE. Antibody-mediated rejection: A review. Ochsner J 2017;17:46-55. Gloor J, Cosio F, Lager DJ, Stegall MD. The spectrum of antibody-mediated renal allograft injury: Implications for treatment. Am J Transplant 2008;8:1367-73. Ganji MR, Harririan A. Chronic allograft dysfunction: Major contributing factors. Iran J Kidney Dis 2012;6:88-93. Nankivell BJ, Borrows RJ, Fung CL, O'Connell PJ, Allen RD, Chapman JR. The natural history of chronic allograft nephropathy. N Engl J Med 2003;349:2326-33. Torres IB, Salcedo M, Moreso F, Sellarés J, Castellá E, Azancot MA, et al. Comparing transplant glomerulopathy in the absence of C4d deposition and donor-specific antibodies to chronic antibody-mediated rejection. Clin Transplant 2014;28:1148-54. Sellarés J, de Freitas DG, Mengel M, Reeve J, Einecke G, Sis B, et al. Understanding the causes of kidney transplant failure: The dominant role of antibody-mediated rejection and nonadherence. Am J Transplant 2012;12:388-99. Redfield RR, Ellis TM, Zhong W, Scalea JR, Zens TJ, Mandelbrot D, et al. Current outcomes of chronic active antibody mediated rejection – A large single center retrospective review using the updated BANFF 2013 criteria. Hum Immunol 2016;77:346-52. Haas M, Loupy A, Lefaucheur C, Roufosse C, Glotz D, Seron D, et al. The Banff 2017 kidney meeting report: Revised diagnostic criteria for chronic active T cell-mediated rejection, antibody-mediated rejection, and prospects for integrative endpoints for next-generation clinical trials. Am J Transplant 2018;18:293-307. Morozumi K, Takeda A, Otsuka Y, Horike K, Gotoh N, Narumi S, et al. Reviewing the pathogenesis of antibody-mediated rejection and renal graft pathology after kidney transplantation. Nephrology (Carlton) 2016;21 Suppl 1:4-8. Hassan R, Gheith O. Chronic antibody-mediated rejection: Review of literature. Iran J Kidney Dis 2014;8:93-103. Gok Oguz E, Ulusal Okyay G, Akoglu H, Merhametsiz O, Yildirim T, Canbakan B, et al. Efficacy of combined plasmapheresis and intravenous immunoglobulin therapy in kidney transplant patients with chronic antibody-mediated rejection. Iran J Kidney Dis 2016;10:151-5. De Serres SA, Noël R, Côté I, Lapointe I, Wagner E, Riopel J, et al. 2013 Banff criteria for chronic active antibody-mediated rejection: Assessment in a real-life setting. Am J Transplant 2016;16:1516-25. Kieran N, Wang X, Perkins J, Davis C, Kendrick E, Bakthavatsalam R, et al. Combination of peritubular C4d and transplant glomerulopathy predicts late renal allograft failure. J Am Soc Nephrol 2009;20:2260-8. Meier-Kriesche HU, Ojo AO, Hanson JA, Cibrik DM, Punch JD, Leichtman AB, et al. Increased impact of acute rejection on chronic allograft failure in recent era. Transplantation 2000;70:1098-100. Remport A, Ivanyi B, Mathe Z, Tinckam K, Mucsi I, Molnar MZ. Better understanding of transplant glomerulopathy secondary to chronic antibody-mediated rejection. Nephrol Dial Transplant 2015;30:1825-33. Shimizu T, Ishida H, Shirakawa H, Omoto K, Tsunoyama K, Iida S, et al. Clinicopathological analysis of transplant glomerulopathy cases. Clin Transplant 2009;23 Suppl 20:39-43. Sreedharanunni S, Joshi K, Duggal R, Nada R, Minz M, Sakhuja V. An analysis of transplant glomerulopathy and thrombotic microangiopathy in kidney transplant biopsies. Transpl Int 2014;27:784-92. Gloor JM, Sethi S, Stegall MD, Park WD, Moore SB, DeGoey S, et al. Transplant glomerulopathy: Subclinical incidence and association with alloantibody. Am J Transplant 2007;7:2124-32. Baid-Agrawal S, Farris AB 3rd, Pascual M, Mauiyyedi S, Farrell ML, Tolkoff-Rubin N, et al. Overlapping pathways to transplant glomerulopathy: Chronic humoral rejection, hepatitis C infection, and thrombotic microangiopathy. Kidney Int 2011;80:879-85. Haas M. Transplant glomerulopathy: It's not always about chronic rejection. Kidney Int 2011;80:801-3. Husain S, Sis B. Advances in the understanding of transplant glomerulopathy. Am J Kidney Dis 2013;62:352-63. Cruzado JM, Carrera M, Torras J, Grinyó JM. Hepatitis C virus infection and de novo glomerular lesions in renal allografts. Am J Transplant 2001;1:171-8. Cosio FG, Grande JP, Wadei H, Larson TS, Griffin MD, Stegall MD. Predicting subsequent decline in kidney allograft function from early surveillance biopsies. Am J Transplant 2005;5:2464-72. Fotheringham J, Angel CA, McKane W. Transplant glomerulopathy: Morphology, associations and mechanism. Nephron Clin Pract 2009;113:c1-7. Sis B, Campbell PM, Mueller T, Hunter C, Cockfield SM, Cruz J, et al. Transplant glomerulopathy, late antibody-mediated rejection and the ABCD tetrad in kidney allograft biopsies for cause. Am J Transplant 2007;7:1743-52. Dörje C, Midtvedt K, Holdaas H, Naper C, Strøm EH, Øyen O, et al. Early versus late acute antibody-mediated rejection in renal transplant recipients. Transplantation 2013;96:79-84. Sun Q, Yang Y. Late and chronic antibody-mediated rejection: Main barrier to long term graft survival. Clin Dev Immunol 2013;2013:859761. Gago M, Cornell LD, Kremers WK, Stegall MD, Cosio FG. Kidney allograft inflammation and fibrosis, causes and consequences. Am J Transplant 2012;12:1199-207. Cosio FG, Grande JP, Larson TS, Gloor JM, Velosa JA, Textor SC, et al. Kidney allograft fibrosis and atrophy early after living donor transplantation. Am J Transplant 2005;5:1130-6. Haas M, Mirocha J, Reinsmoen NL, Vo AA, Choi J, Kahwaji JM, et al. Differences in pathologic features and graft outcomes in antibody-mediated rejection of renal allografts due to persistent/recurrent versus de novo donor-specific antibodies. Kidney Int 2017;91:729-37. Naesens M, Kuypers DR, De Vusser K, Vanrenterghem Y, Evenepoel P, Claes K, et al. Chronic histological damage in early indication biopsies is an independent risk factor for late renal allograft failure. Am J Transplant 2013;13:86-99. Gibson IW, Gwinner W, Bröcker V, Sis B, Riopel J, Roberts IS, et al. Peritubular capillaritis in renal allografts: Prevalence, scoring system, reproducibility and clinicopathological correlates. Am J Transplant 2008;8:819-25. Sis B, Jhangri GS, Riopel J, Chang J, de Freitas DG, Hidalgo L, et al. Anew diagnostic algorithm for antibody-mediated microcirculation inflammation in kidney transplants. Am J Transplant 2012;12:1168-79. Einecke G, Sis B, Reeve J, Mengel M, Campbell PM, Hidalgo LG, et al. Antibody-mediated microcirculation injury is the major cause of late kidney transplant failure. Am J Transplant 2009;9:2520-31. Racusen LC, Bagnasco SM. Peritubular capillaritis in the renal allograft takes center stage. Kidney Int 2015;88:218-20.
de Kort H, Willicombe M, Brookes P, Dominy KM, Santos-Nunez E, Galliford JW, et al. Microcirculation inflammation associates with outcome in renal transplant patients with de novo donor-specific antibodies. Am J Transplant 2013;13:485-92. Jordan SC, Quartel AW, Czer LS, Admon D, Chen G, Fishbein MC, et al. Posttransplant therapy using high-dose human immunoglobulin (intravenous gammaglobulin) to control acute humoral rejection in renal and cardiac allograft recipients and potential mechanism of action. Transplantation 1998;66:800-5. Fehr T, Rüsi B, Fischer A, Hopfer H, Wüthrich RP, Gaspert A. Rituximab and intravenous immunoglobulin treatment of chronic antibody-mediated kidney allograft rejection. Transplantation 2009;87:1837-41. Rocha PN, Butterly DW, Greenberg A, Reddan DN, Tuttle-Newhall J, Collins BH, et al. Beneficial effect of plasmapheresis and intravenous immunoglobulin on renal allograft survival of patients with acute humoral rejection. Transplantation 2003;75:1490-5. Smith RN, Malik F, Goes N, Farris AB, Zorn E, Saidman S, et al. Partial therapeutic response to rituximab for the treatment of chronic alloantibody mediated rejection of kidney allografts. Transpl Immunol 2012;27:107-13. Stolyarevich ES, Artyukhina LA, Zakharova EV, Tomilina NA. Chronic antibody mediated rejection of renal allograft – Efficacy of combined treatment with plasma exchanges, intravenous immunoglobulin and rituximab (One Center Experience). J Nephrol Ther 2016;6:243. Moreso F, Crespo M, Ruiz JC, Torres A, Gutierrez-Dalmau A, Osuna A, et al. Treatment of chronic antibody mediated rejection with intravenous immunoglobulins and rituximab: A multicenter, prospective, randomized, double-blind clinical trial. Am J Transplant 2018;18:927-35. Waiser J, Budde K, Schütz M, Liefeldt L, Rudolph B, Schönemann C, et al. Comparison between bortezomib and rituximab in the treatment of antibody-mediated renal allograft rejection. Nephrol Dial Transplant 2012;27:1246-51.